During the winter of 2010, Jen and I visited farmers in preparation for writing a book on farmer-mentors, a second volume in the Twilight Meetings series. This trip was a chance to visit some of the very best small farms we knew of. On these visits we saw innovations that had not been documented or shared. It seems that most of these talented farmers are not much for self-promotion! In fact, they seemed to regard their inventions as ordinary solutions to everyday problems. Last summer the idea was born to put these inventions and a few of our own into practice on the farm. We received funding from The October Hill Foundation to cover the initial costs. A description of each invention and how they relate to each other follows. These tools provide almost perfect weed control in most crops, even in the row. Since the SOTEC has a high clearance frame, it can straddle many plants even when mature, keeping them weed free all season long. We are designing the SOTEC to enable one person to prepare and cultivate several acres of mixed vegetables and small fruit with no additional labour. The first prototype should be available for testing in 2012. 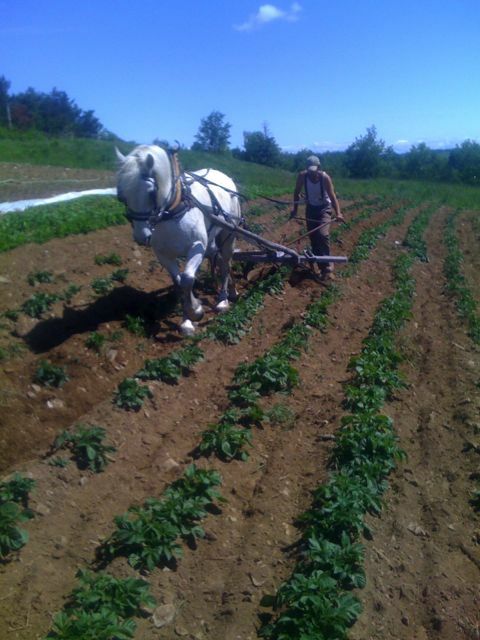 The next design comes from Isaac Villeneuve, a young farmer in Northern New Brunswick. He built a simple but very effective root crop washer that he uses along with a three bin bagging line to prepare many tonnes of carrots and other roots for his busy stall at the Fredericton NB farmers market. This is a smaller version of the equipment a large produce packer would use. It allows Isaac and his wife Stephanie to do all of this work themselves, saving the expense of hiring help or the burn-out of doing it all by hand. Isaac’s barrel washer cost him about $500 in parts and took one full day to make. Compared to a factory built model costing around $3600 plus shipping, this is a great example of how to save money by building what you need on the farm. 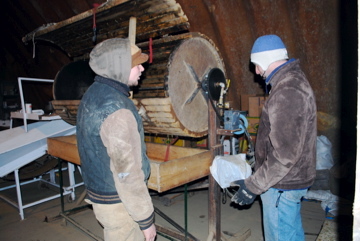 I hope to travel up to Isaac’s farm this winter to make a washer with him, documenting the process step-by-step. Plans to make one will be made available in the coming months. 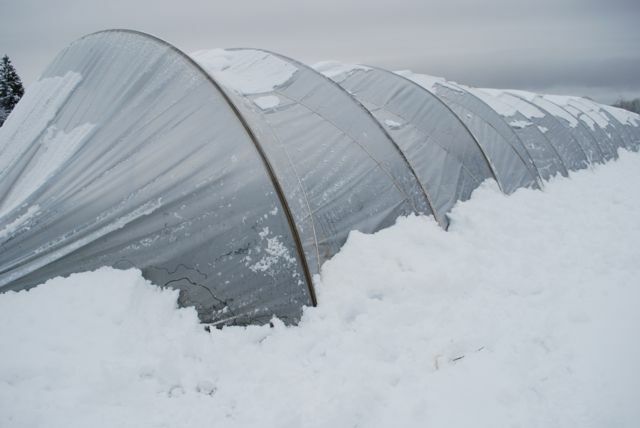 The lack of proper winter storage facilities is an all-too-common problem on small vegetable farms. Much perfectly good food is wasted because of a lack of good winter storage facilities. 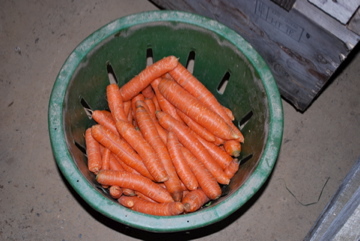 Some farms keep their winter crops like cabbages, potatoes, carrots, or beets in a walk-in cooler all winter, selling them throughout the cold months. The heat generated by the circulation fans will keep the produce from freezing. In a warm spell, the cooler is able to keep the produce cold. Besides the drawback of electricity use in the cooler, there is the high cost of the refrigeration equipment itself. When growing a significant amount of winter storage crops, this strategy can be prohibitively expensive. Traditionally farmers used below-grade cellars with insulated roofs to keep produce from freezing. The coolness of the earth was used as a free way to keep produce at optimum temperatures and humidity. The below-grade cellars are simple, but difficult to access. Building root cellars is not an easy project because a hole in the ground will often collect water and considering how common flooded basements are, it is clear that many builders don’t get it right. In some locations, no matter how much money or building knowledge you have, a well-drained root cellar is just not going to happen. We are working on a cold storage design that is inexpensive to build and operate while doing a great job of keeping the harvest in tip-top shape through the winter. Bill MacKentley, owner of St Lawrence Nursery in Potsdam, NY, built a wonderful cold storage facility that we want to use as a starting point for a low-cost, farmer-built design of our own. Bill’s cold storage only cost $7.50 per square foot to build. I don’t know how much a conventional cold storage building would cost, but would guess a lot, a whole lot, more. Except for the concrete, it was mostly built with used materials and no hired labour. We hope to modify the design to use less heavy steel for the roof. This will keep the cost down when used steel can’t be found and will make it easier to build. What I like most about the on-grade design is easy access. Produce can be rolled in and out, with no ramps or stairs to deal with. This is a huge time and back saver, two things farmers need to save however they can! 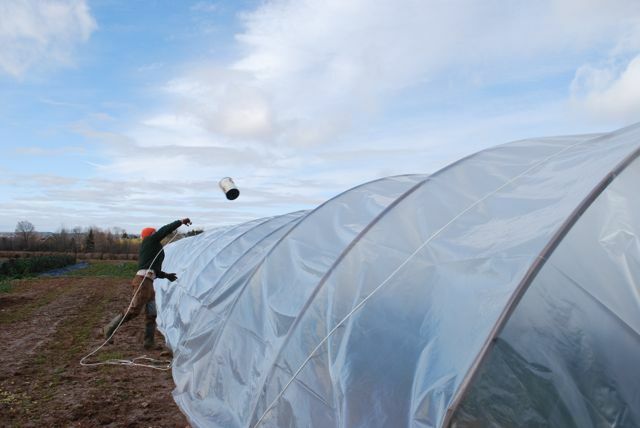 Many vegetable producers have a love-hate relationship with greenhouses. They provide needed income early and late in the production season, are a welcome place to work in bad weather and generate a lot of revenue in a small space. But, they are a lot of work to set up, cost a lot to buy, and have the annoying tendency of blowing away in big storms. Todd Hanley, a market gardener from Oklahoma came up with a simple hoop house design that we have begun to experiment with. Todd grew up on an organic vegetable farm in Oklahoma. In university, he studied structural engineering. Coming back to the farm, he put up a conventional greenhouse for growing greens through the winter. 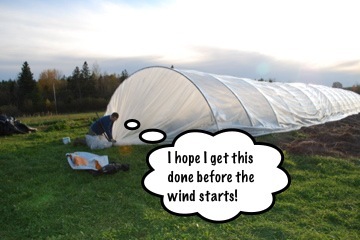 When the greenhouse blew away in a windstorm, Todd decided to design a better greenhouse. The “Hanley Hoop House” is the strongest, easiest to build, and least expensive greenhouse available. First built in 2008, the design has yet to catch on in Canada. We would like to do something about that! With these hoophouses, farmers can produce crops earlier in the spring and later in the fall, tapping in to the consumer enthusiasm for local food. Together with good winter storage of vegetables in root cellars, small-scale growers can be selling vegetables from their farms all year long. Season extension is crucial for financial viability. The Hanley house has no ridge purlin, no baseboards, and easy-to-install re-bar foundation posts. This cuts out most of the time-consuming work involved with setting up a hoop house. A one hundred foot long house can be set up or taken down in a few hours, making these houses almost as quick to move as the complicated mobile greenhouses on wheels and tracks that are gaining in popularity. With such simple components, the Hanley House is very economical. Including plastic, these houses cost well under one dollar per square foot. or uncover the house once again. If all goes well, this experiment will help small growers reap the many rewards of greenhouses while minimizing the headaches. We are putting up three Hanley houses this spring to test, refine, and demonstrate their effectiveness. They are good value, easy to modify in case of extreme weather, and easy to put up. 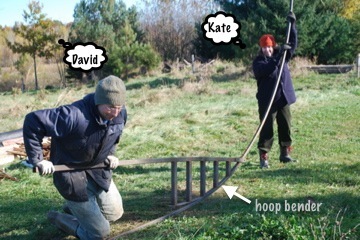 We’ve already built the hoop bender for making the ribs ourselves. 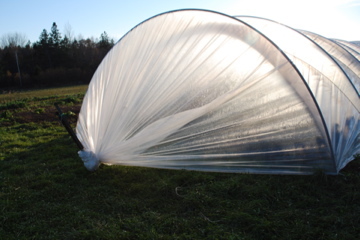 We built one hoop house this fall to test it in the wind and snow. The bender itself is a great example of an inexpensive tool that can be manufactured in any community for use on local farms. Once we have completed the development and testing of these innovations, we will put them into practice on the farm We also intend to visit other farmers who are experimenting with these innovations, lending a hand and documenting improvements, problems, and other interesting discoveries. 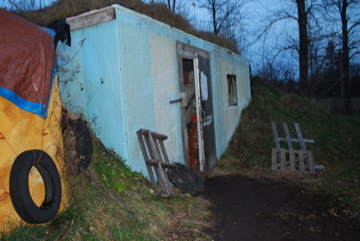 This entry was posted in efficiency and tagged cold storage, hoophouse, root washer, season extension, walking tractor. Bookmark the permalink. Good stuff! Have you had a chance to document the step-by-step approach to building the root crop barrel washer? I hope to build one this winter! Thanks! I am a farmer looking to make my own barrel root washer. In my search for plans online I came across your blog. I too was wondering if you were able to find the time to document the plans. I know how busy the season gets and time flies by before we know it. If you were able to document the plans I would love to know how I can receive a copy. I am interested in putting my root washer together this winter. I hope this e-mail finds you well and I look forward to hearing from you. Thanks for your time. We have a first draft of the barrel washer instructions that explain what to do step-by-step. What I don’t have is measurements of the washer, which I need to make a materials list and cut list. The washer is on loan right now at a friend’s farm. We are planning to pick it up within a few weeks and get the rest of the plans finished soon. To get you both started, we will post the first draft of the instructions and a short video of the washer in operation.